← Early spring hive manipulations – be careful! It is now mid-March here in Kentucky and temperatures are starting to get warm enough to inspect hives after the long sleep of winter. What do we look for? What should we want to see on the frames and what are our concerns? We should be looking for brood, food and bees. First, check for brood, both larvae (uncapped brood) and pupae (capped brood). If it has been warm where you live (extended temperatures above 60°F) and the bees have been carrying in pollen, your colonies should be rearing brood. Look for larvae (uncapped brood) and pupae (capped brood). If you are seeing pollen being brought into the hive and frames of brood this will tell you that the spring buildup (increased population) is starting. If you are seeing a number of frames of brood – say four or more, the spring buildup in your hives is well underway. I suggest you make notes for each hive, note the number of frames that you see brood on and how many of each. This information will aid you as spring progresses and you can judge how each hive is growing. You should also check food stores, both honey and pollen. This time of year I would like to see at least several full, deep frames of honey left over from what was stored last fall, as well as fresh nectar. This would be enough food to get the colonies through any cold spells that may still occur, or through any extended rainy periods when foragers cannot get out of the hive. 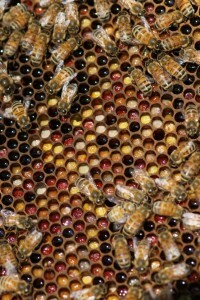 Note if you are seeing fresh nectar (uncapped honey), especially near young brood. 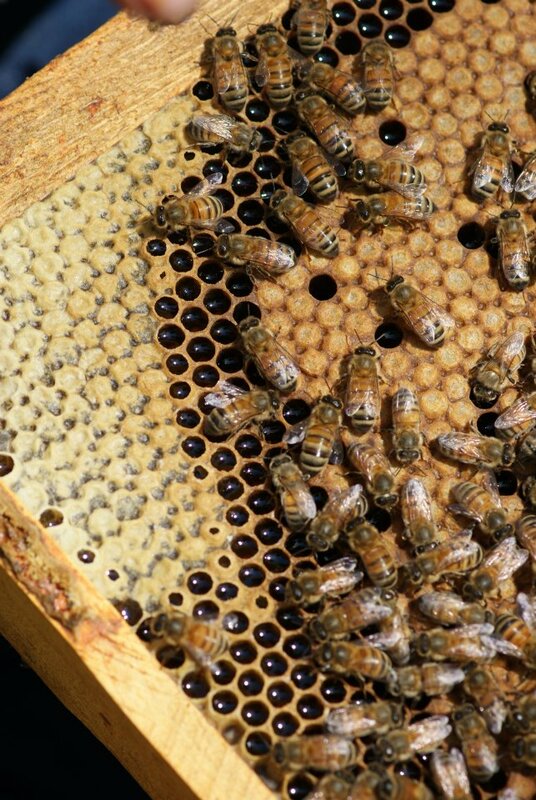 Note the Capped older honey next to the frame sidebar and the fresher, liquid nectar – next to the brood. You may actually count the frames of stored, capped honey (from last fall) or determine that sufficient honey is present by the weight of the top deeps (are they heavy?) as you lift them to check the bottom boxes. Again, make a written note of the hive’s food stores, especially for frames that you think may need be low on food stores or need feeding. 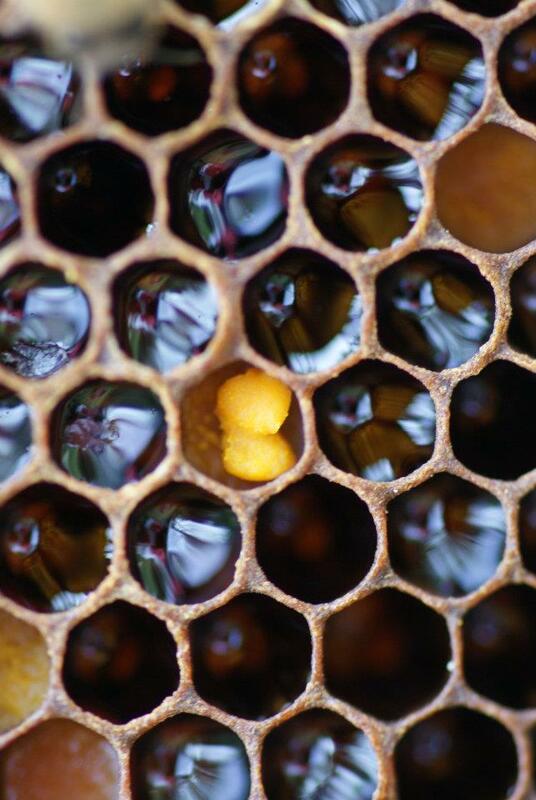 In addition to honey and nectar, look to see if there are cells containing fresh pollen. Is there pollen left over from last fall in some of the frames? If there is it is a plus; this gives the colony some pollen reserves. How to tell fresh from old? Fresh pollen has a bright color, and will be found adjacent to cells containing fresh nectar and near where brood is being reared on the same frames. Very fresh pollen in cell – these are pellets of pollen just placed in the cell, they will later be packed by bees and will more closely resemble photo below. Older pollen is duller, and may be found on frames outside where new brood is being produced, though available if needed. Pollen is a very important part of the bees’ diet when rearing larvae, so I always check for stores of it in the hive along with honey reserves. The third thing looked for are bees. Note the number of frames covered with bees in the top brood box in order to get an idea of hive population or strength. A hive with even 7-8 frames in early spring, which this year is March in Kentucky. I hope for full hives by April when our nectar will be in full flow and the bees will commence serious honey production. You very likely will see all of the bees, brood, eggs and other activity in the top brood boxes in your hives. The bottom boxes may be mostly empty, which is normal for this time of year. The typical winter procedure of the colony’s cluster (in parts of the world that have winter) is to consume all the honey in the bottom box during the winter, then move up into top prior to early spring. In the bottom boxes, you may see some bees, but bees only; no brood or honey – yet, which is also normal for early spring. This is not necessarily a negative (that the entire hive is not full of bees), this gives the colonies room to expand during the next month, lessens the chances of early swarming (hopefully), and allows the colonies to begin reaching full strength later in the spring, as the nectar flow gets stronger. I suggest re-checking your hives again in a couple of weeks, if the weather cooperates, and you should expect to see the brood area expand into the bottom boxes at that time, if they have not already. When I remove frames in the early spring, I am careful to put them back in the same order in which I remove them. I don’t always do this. Later in the spring I will rearrange or remove frames (replacing them with other frames) to manage brood production, to TRY to prevent swarming, or for other management reasons. But now, with many cold nights still to come, I’m very careful to not disturb the natural clustering of the colonies, which are concentrated around brood and adjacent frames of food. You may have noticed that, in my suggestions of things to do, I did not mention looking for queens. The reason is that there is no need to. 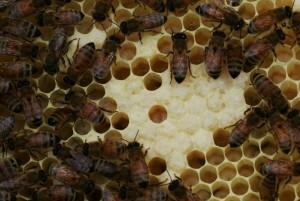 By looking at brood, and its presence (especially that of the larvae) told us that queens are active in our hives. We do not even need to look for eggs in these first spring inspections, I sometimes do so, but it is not really necessary, and it takes longer. I am satisfied that my observations of larvae and pupae tell me what I needed to know about condition of the hives. Had I not seen brood or eggs in one of the hives, I would have then looked for the queen. I inspected;my hives yesterday and I have one hive that has a lot of bees but no brood. there are two supers of honey and both hive bodies seem to be empty of brood. These bees have always been a little more testy than my other hives. Just wondering? what you thought. It is possible that they are queenless. Do a careful search for the queen. Queenless hives will often make a roaring sound, be more aggressive (sometimes getting very grouchy) and will run on the comb. I found one last week in my own apiary. When I took the lid off the bees were rapidly moving on top of the frames and making this roaring sound. Beekeepers will call it a queenless roar. I combined this hive with a weak hive which had a queen.